This is the post in which I embarrass myself by losing control over ... corn. Yes, it's true. I can't express in words how much this vegetable has overcome me this month. I'm not proud of it, but I'm not exactly in control of this obsession either. I got several ears of corn in the AHO box the past couple of weeks. That makes me so happy I could dance. I absolutely love fresh corn, and this so happens to be some of the very best corn I have ever eaten in my life. I am not at all exaggerating when I say that. This corn is so very sweet and crisp and juicy. It is so very amazing. However, I looked ahead at what I will get in the box next week, and I am almost in tears as I report that corn is not on the list. I may not make it another 49 weeks until corn season again. Most of the corn went straight to the grill and then straight to my belly. Okay, I shared some with my family, and even managed to be gracious to some dinner guests and offered them some too. For the most part, though, that delicious corn was gnawed straight from the ears. The way corn should be eaten. However, there was one corn recipe that I stumbled across and just couldn't resist trying. I hated to sacrifice the corn it required, but as it turns out, it is so very delicious. I can't decide which way I like the corn better. 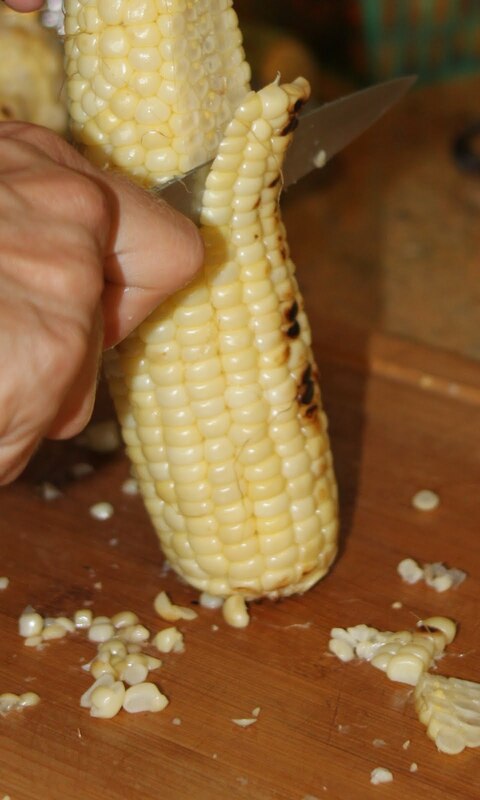 On the one hand, straight from the cob is heavenly. On the other hand, this Southern Skillet Corn somehow manages to take all of the best aspects of the corn and enhance them. It's an even better heaven. It is sweet and peppery, creamy but still crisp. I really want to eat it every day for the rest of my life. It makes me want to go buy some corn from the market and make more this very minute, but I am afraid that I have been spoiled and no other corn will ever compare to the corn I get from Abundant Harvest. This recipe, which I found here, isn't exactly the healthiest thing to do to a vegetable. What with adding butter and flour and sugar, I can't say it is health food. But it's worth it. Soooo worth it. First, shuck and clean the corn. Cut the corn from the cob, and then scrape the remaining cob to get all the milk out of it. That sweet milk is what you really really want to be able to taste. Combine the flour, sugar, salt and pepper in a small bowl. Add the water, and whisk together to combine it all. Melt butter over medium-low heat in a large, heavy bottomed skillet. Add the corn and the flour mixture and cook it all over medium-low heat for 40-45 minutes, stirring occasionally. It will go from corn floating in milky liquid to a creamy, thickened, buttery, amazing dish. And you'll wish you had been eating it all your life.